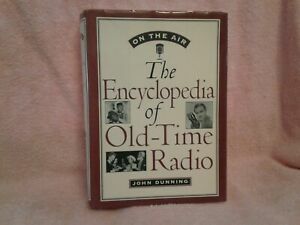 Now long out of print, John Dunning's Tune in Yesterday was the definitive one-volume reference on old-time radio broadcasting. Now, in On the Air, Dunning has completely rethought this classic work, reorganizing the material and doubling its coverage, to provide a richer and more informative account of radio's golden age. Here are some 1,500 radio shows presented in alphabetical order. The great programs of the '30s, '40s, and '50s are all here--Amos 'n' Andy, Fibber McGee and Molly,The Lone Ranger, Major Bowes' Original Amateur Hour, and The March of Time, to name only a few. For each, Dunning provides a complete broadcast history, with the timeslot, the network, and the name of the show's advertisers. He also lists major cast members, announcers, producers, directors, writers, and sound effects people--even the show's theme song. There are also umbrella entries, such as "News Broadcasts," which features an engaging essay on radio news, with capsule biographies of major broadcasters, such as Lowell Thomas and Edward R. Murrow. Equally important, Dunning provides a fascinating account of each program, taking us behind the scenes to capture the feel of the performance, such as the ghastly sounds of Lights Out (a horror drama where heads rolled and bones crunched), and providing engrossing biographies of the main people involved in the show. A wonderful read for everyone who loves old-time radio, On the Air is a must purchase for all radio hobbyists and anyone interested in 20th-century American history. It is an essential reference work for libraries and radio stations. The book came out in 1998-99 and is one of the best reference works for this historic period of radio entertainment. Though out of print, copies still sell for a good price because it is the "go to" source for broadcasters, historians, and trivia seekers when it comes to the shows, the personalities, and the sponsors of radio show from the 1920s through the 1960s. The author's talk radio shows focusing on these old time radio were some of the best on the airwaves, and his encyclopedic knowledge of the subject makes for good reading. I give away copies to young people that don't understand OTR in hopes that they will "return to those thrilling days. . ." I've only ever seen it in hardback, but it is well worth the space on your ever-shrinking bookshelf. Great book for gift for d.j.!!! I absolutely love this book!!!!!!!! I bought this book for the wonderful man in my life Who is a radio D.J.!!!! It is going to be a Christmas present, and he' s going to flip!!! In fact I want one too. This book has everything you could ask for when it comes to information and bringing back so many memories. I have not found a book that even comes close to the complete information as this one does. There is only one thing that's missing, and that is pictures or photos, but I understand if it had pics and photos also, you wouldn't have as much information and you wouldn't be able to pick it up!!!!!! Other than that, I absolutely love this book!!!! Great book for a gift for anyone who loves radio history!!!! If You Love Old Time Radio You NEED This Book! I listen to free OTR at archive dot org but I wondered if there were other great radio shows out there that I didn't know anything about. I was born in 1959, so just a bit past when most of the radio shows aired. This book is really comprehensive, though I found that it didn't mention some of my favorite radio shows. However, some of them like Hello Sucker were more local programs. Anyhow, this book is HUGE and it is fantastic! I want to go through it with a notebook and write down all the programs I want to try to listen to. The book has quite extensive reviews of some of the programs. Initially I thought the book was expensive but when I got it I discovered that it is worth every penny! You really need this book if you love OTR! It is what the title says. I am a fan of old time radio and try to recall facts and general info on the topic. This book is truly a Godsend for me. Thanks for doing all of the research necessary for such a compilation.